Add a touch of Mediterranean magic to your garden. 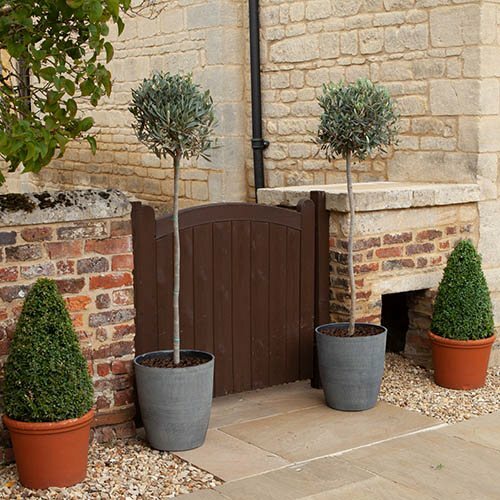 Bring a warm Mediterranean feel to your garden, patio, doorways and pathways with this fantastic exotic standard olive bush! Professionally grown to form a 'lollipop' shaped small tree with a wonderful ball of foliage on top of an elegant, straight stem. Despite their Mediterranean heritage, olives are actually surprisingly tough and hardy, and will flourish in the UK! Olives are low maintenance, easy to grow and very slow growing which is ideal for busy gardeners. Supplied as a 1.4m (4.6ft) tall, standard form bush. Bring a warm Mediterranean feel to your garden this summer with this fantastic standard olive bush! These well-established plants have been professionally grown with a wonderful ball of foliage on top of an elegant stem. Despite their Mediterranean heritage, olives are surprisingly tough and will happily grow in the UK down to -8C in winter, although it's best if you can protect them a little! With its neatly shaped, evergreen grey-green foliage, this Olive is perfect in a border or patio pot and will also look great in a pot in a conservatory. They love hot, sunny spots and thrive in free draining soil. Your olive will produce small, creamy flowers in spring, which self-pollinate, and may even produce you small olive fruits in hot, dry summers when they get plenty of time to ripen. They look so exotic and Mediterranean though, you should grow them anyway! Olives are low maintenance, easy to grow and very slow growing, ideal for small gardens or busy gardeners. Great value and will add a touch of class to your patio! All our Olives are sourced from specialist growers who are regularly inspected and tested for plant pests and diseases, including the new disease threat Xylella. We do not source Olives from High Risk areas. This is followed by further checks and inspections on our own Lincs nursery by DEFRA. Supplied as a 1.4m tall, standard form tree. When positioning your tree, choose the sunniest spot available in your garden. If planting outside, this can be done from March to May. Select a well-drained, sheltered site against or near a sunny wall and stake plants well. Although olives are hardy, branches may be damaged by severe frosts. Store in a frost-free place if grown in pots or cover the branches with horticultural fleece.